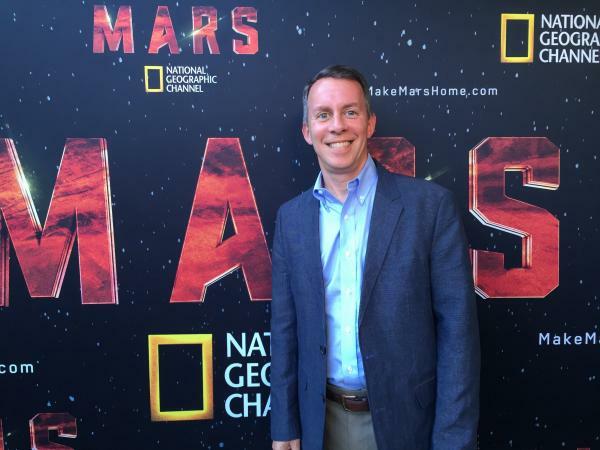 November 14, 2016 – National Geographic will debut its six-part miniseries “Mars” tonight, November 14, and the fascinating docudrama has a CU Boulder connection. Incoming engineering dean and aerospace professor Bobby Braun served as a technical consultant for the show over the past year, working with the writers, producers, director, set designers and actors to make the show as factual as possible. The production, directed by Ron Howard, depicts the first human landing on Mars in 2033 through a mix of scripted drama and documentary footage from real-world space pioneers about the hurdles and challenges of the journey. Part one airs at 7 p.m. MT Monday on National Geographic and is also available now for free online streaming. The series will continue each Monday for six weeks. Striving for scientific accuracy, National Geographic tapped numerous scientists to advise on the production, including Braun, a former aerospace professor at Georgia Tech who spent 16 years at the NASA Langley Research Center. Braun helped lead the team that put the first rover on Mars. It also features interviews with SpaceX founder Elon Musk, Neil deGrasse Tyson, astronaut Scott Kelly and other leaders in the field. The premiere is accompanied by a National Geographic magazine cover story and website devoted to Mars, a companion book, educational materials for teachers, and a special edition of USA Today.